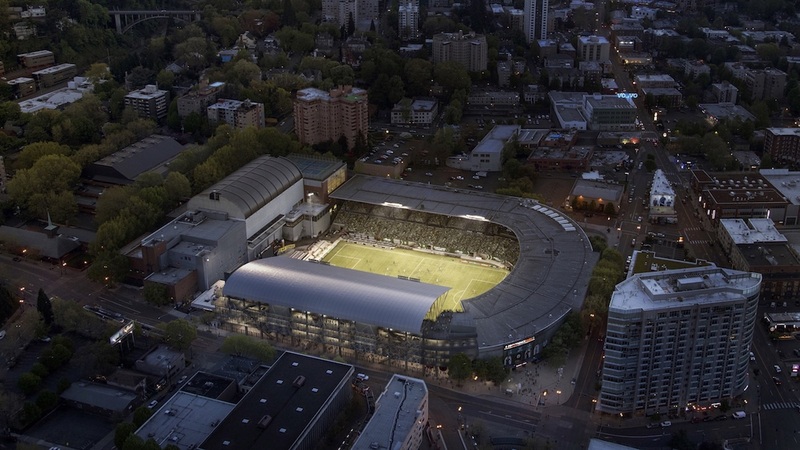 The history of Providence Providence dates back to 1893, when the site was known as Multnomah Field. The stadium seen today was designed by AE Doyle, and opened in 1926. 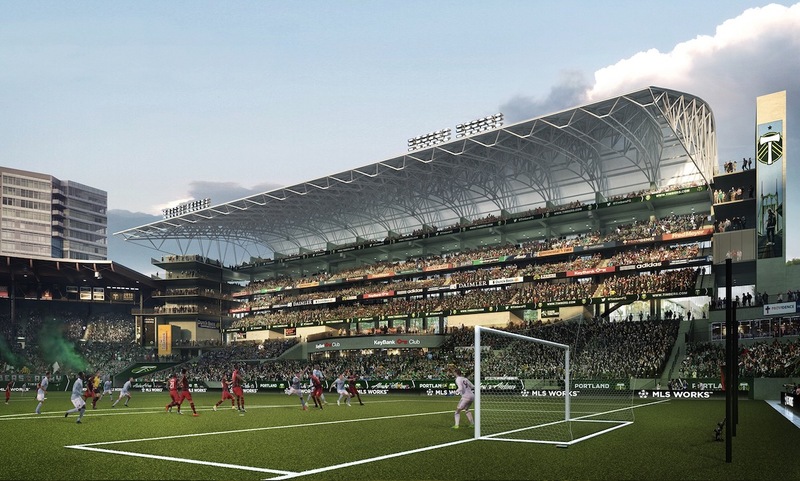 In 2011 the stadium for renovated and expanded for use by the Timbers, to designs by Ellerbe Becket, with new seating added at the east side of the pitch. The roof that was added as part of the 2011 expansion will be removed to make way for the additional seating proposed as part of the latest remodel. 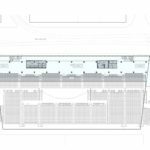 The new structure will extend over the sidewalk on SW 18th Ave, creating a covered arcade. In order to get sufficient width for the arcade the sidewalk will be widened, with existing on-street parking removed. 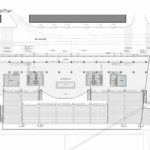 The seating will be arranged in a stacked vertical configuration, inspired by venues such as Buenos Aires’ La Bombonera and London’s Shakespeare’s Globe. 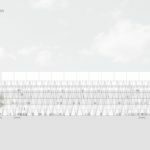 The street facing facade will have a “lacework” pattern, constructed with tensile tube steel. 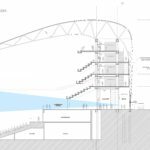 Other materials will include exposed concrete, glazing, and steel guardrails. A fabric material is being investigated for the roof covering. At the May 11th Design Advice hearing the Design Commission was generally very supportive of the project as a whole. 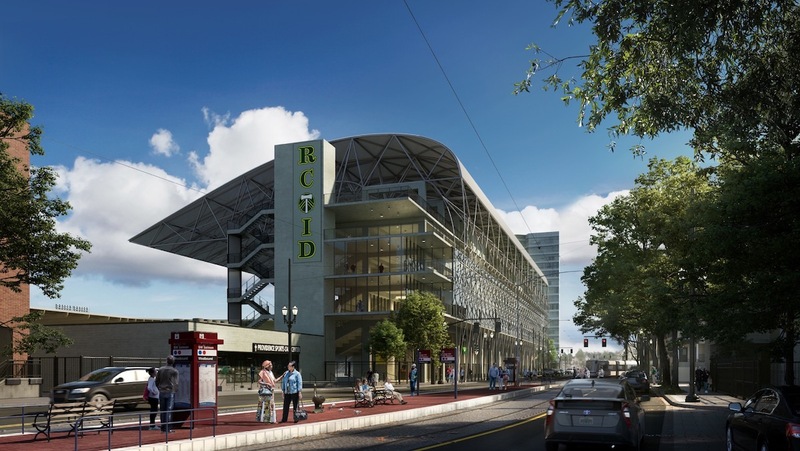 Areas where the Commission encouraged further investigation, summarized in a memo, included: the width of the arcade and pedestrian experience along SW 18th Ave; the design of the southern stair tower element; and how right-of-way elements such as street lights and catenary poles would be integrated into the design. 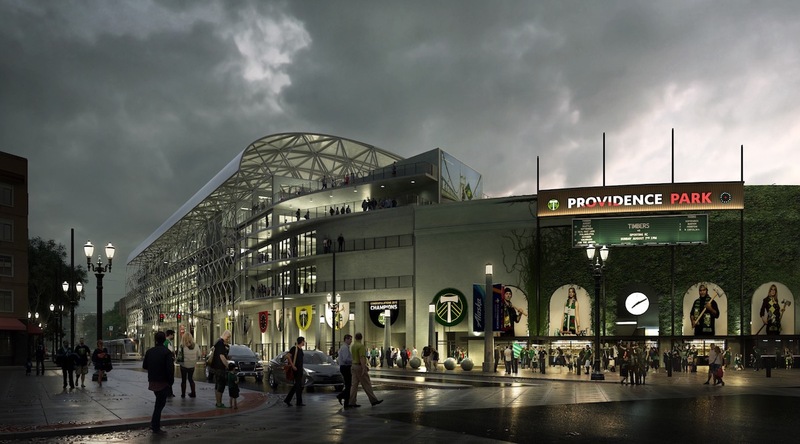 In order to gain approval the Providence Park expansion will be required to go through a Type III Design Review, with public hearings before the Design Commission. Because the building will extend over the right-of-way it will also required to go through a Major Encroachment Review, which requires City Council approval. Construction is expected to happen over two off-seasons, with work beginning this year or early next year, for a 2019 or 2020 completion. This entry was posted in Allied Works Architecture, Goose Hollow, Providence Park Expansion. Bookmark the permalink. So much for the residents of the Ink Blocks getting free viewing of soccer matches! 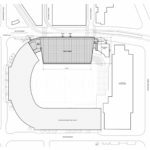 How about building a vertical section with canopy roof on the south side in front of the MAC also? Wait! How do they get the chutzpah to ask for a row of columns in the sidewalk? 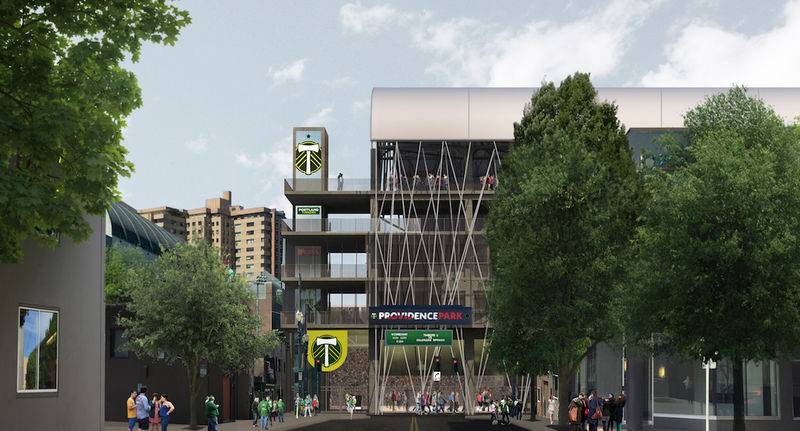 I don’t mind the overhang, and perhaps a few columns like on E Burnside. But this is a lot of small columns, which are constricting pedestrian flow (and there will be a lot of pedestrians) at three different crosswalks! It looks like the whole construction could have been slid 12 to the west, with the same effect and the same seating, except for reducing the open area above the “Key Bank Club Terrace”. But usurpation of public space for Bank patrons would be right along the same lines as for art patrons, wouldn’t it? As you read the article Doug you’ll notice that it is written that to aid in the flow of pedestrians either from the public or game fans, sidewalks will be widened. I saw that on the plans. The sidewalks along 18th appear to be 15′ now, except that for most of the relevant frontage, they narrow to about 8′ to create a parking lane. These pull-ins will be removed (the support posts would prohibit the parking anyway), and the curb moved out to make 15′ from curb to property line the whole way. But for all of the frontage, the sidewalk clear area would be narrowed to about 10′ by the posts/ties. Yes, there’s another 3 feet or so between the posts and the curb, but the crowds will be moving around all these posts, which appear to be every 10′ or so. It’s better, but certainly too constrained for the use it will get. Looks like they will be ripping out the trees along the sidewalk as well.